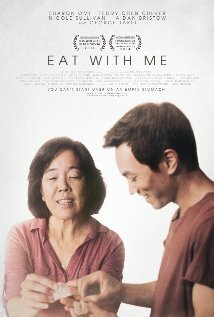 I thought it was fitting that I “close out” Pride weekend by watching “Eat With Me,” one of the best “gay” movies I have seen recently. First of all, It is also nice to see a gay Asian character (Elliot, here played by Teddy Chen Culver) who isn’t portrayed as an Asian stereotype, and it would have been very easy for this film to do that, since the character works as a chef in a family-owned Chinese restaurant. Moreover, the story treats his beign gay almost as an afterthought. Elliot’s mother arrives at his restaurant and asks if she could stay with him at his apartment, after having some kind of argument with her husband. He takes her in, and in the beginning she tries to take control of the apartment and in a more subtle way, his life. Even though she has known that he is gay, she is stunned to see beefcake magazines on his coffee table. At the same time, Elliot starts dating, and her world is shattered when she sees them together in bed one morning. There are a lot of honest moments here, and Sharon Omi is understatedly effective as the mother. Even though conflicts, they are never dealt with hystrionics – the struggle is more internal, just like real. Maybe because I now have lost both my parent, but I foudn myself tearing up because you can feel the love that mother and son have for each other, especially when those are expressed through their mutual love of cooking (Think of this as a gay version of ‘Eat, Pray, Love’ where some feelings are expressed through culinary creations) There are tons of love to celebrate in this movie (I especially liked the ‘courtship’ between Elliot and Ian) and I think a great example of how we love in these modern days.